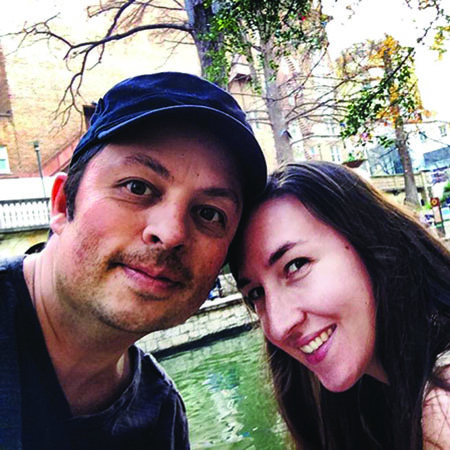 Since we purchased Meriwether (our RV), my wife, Brittany, and I have been thinking about preventative RV roof . We don’t have any known leaks, but we know that if we don’t perform preventative maintenance, we will eventually. I figure, if something is attached to the roof, it means that somewhere there is a connecting hole between the roof and the inside of the RV. On the roof side, these attached items (vent covers, rear ladder, antenna, etc.) are normally sealed from water intrusion with a self-leveling lap sealant. This sealant doesn’t last forever, and, eventually, any area previously sealed will develop cracks due to the elements. 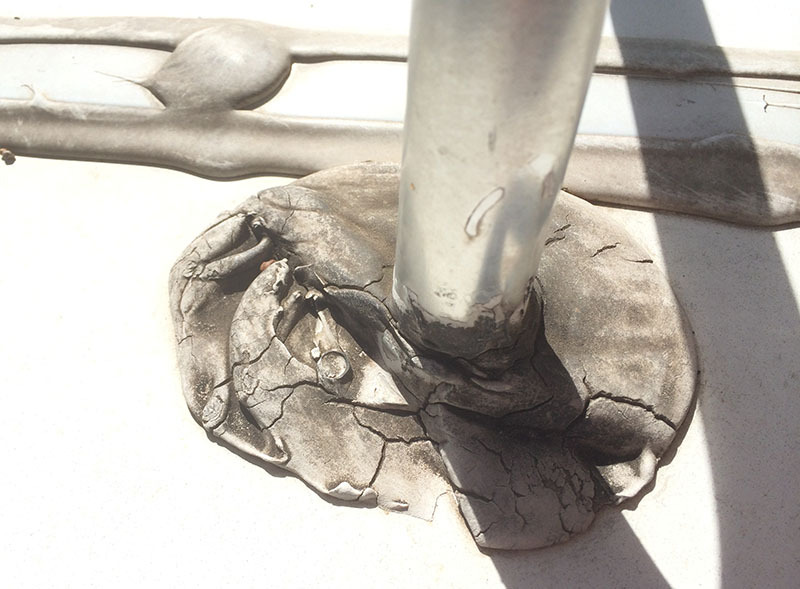 Remember, it’s a lot easier and cheaper to do your own annual RV roof maintenance than it is to wait until you have water coming in through the roof! I’m pretty much clueless when it comes to anything handyman-ish or mechanical, but surprisingly, this annual RV roof maintenance was a breeze. So, if you are one of those folks who have been thinking that you’d rather pay someone to do this task for you, think again. 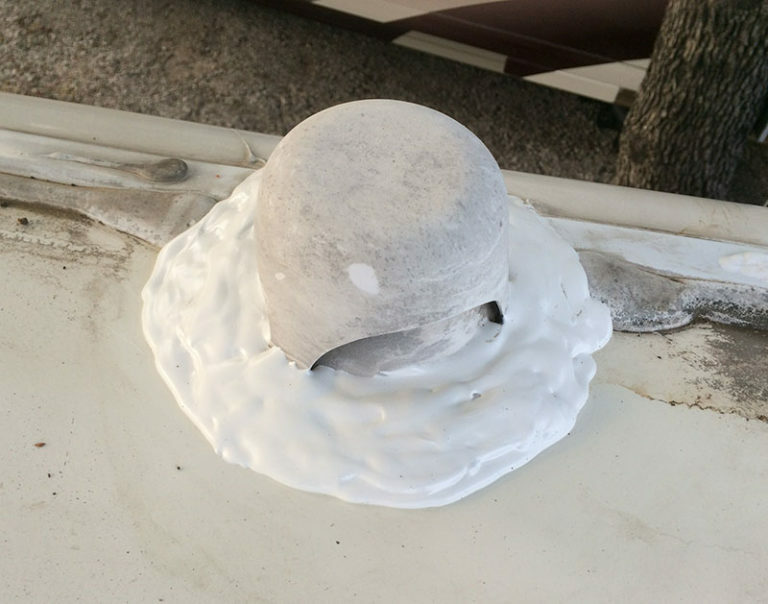 Note: This article deals specifically with the sealing of items attached to a fiberglass roof. If your roof is made of another material, you’ll need to research your specific roof type. Some sealants and chemicals are not recommended for all roof types. A. The first thing you want to do is inspect your roof. Make sure you have a safety observer such as your partner or a neighbor. Items to bring are a water bottle, Sharpie pen and a small camera (most cell phones have a camera). B. Once you’re on the roof, start at the back and work your way toward the front of the coach. Take a look at everything that has been previously sealed by lap sealant, and do a close examination for any cracks. These could range from hairline cracks to prominent, major crevices. C. The obvious cracks you don’t need to mark, but mark any hairline cracks with your sharpie pen so you don’t miss them when you come up to do the work. You may want to take some photos to document your work along the way. D. Check specifically around the areas where the ladder attaches to the roof and where the vents for the tanks and the shower attach, as these areas tend to crack more readily. Once you’re at the front of the coach, do a second sweep while on your way back to the ladder and double-check to see if you may have missed something. Note: Do not use lap-sealant on skylights. There is a specific product for them. To get a rough idea of how many tubes of lap sealant you’ll need to do the roof, you’ll use about one tube for every four areas of repair. Drink some water and head back down to grab your tools and supplies for the job. You don’t need your entire toolbox for this job. I recommend wearing an old pair of work jeans, as the lap sealant can be pretty sticky stuff. That’s it. Now that you have all the tools, let’s get to the job itself. 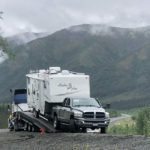 To learn more about RV maintenance and RV life check out RVOU! Again, I suggest you start at the back of the coach and work your way forward. 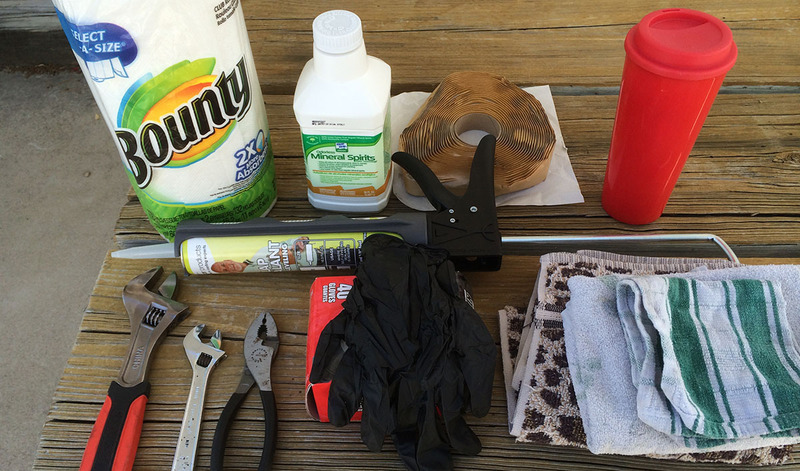 You probably noticed when you first found items that were previously sealed with lap sealant that the weather tends to blacken the old sealant. This is actually dirt and grime, and it needs to be cleaned off so the new sealant will stick. You don’t need to remove the old lap sealant. You’re only going to touch up the areas that have cracks. If you want to remove the old sealant, you can, but Dicor lap sealant is designed to be put on in layers. The next step is to put on your disposable nitrile gloves. Wipe down all areas where you’re going to apply sealant, using the mineral spirits and a rag. You’ll find it’s easier to use a paper towel or the old toothbrush for the hard-to-reach areas, so go ahead and use those as needed. Once you’ve wiped down the old lap sealant with the mineral spirits and some muscle, you’ll find they become white again. These areas need to dry completely before applying sealant, so move on to the next area to clean. The reason you want to do all of the cleaning first is, once you’ve opened up the tube of lap sealant, you’ll need to use it all right away. If you have to pause to clean off another section, it can be a messy mistake. By working from the back to the front of the coach the back will be dry enough for you to begin the sealing process once you are ready to start sealing. Now that all your surfaces are clean, break out your caulking gun and load it with your self-leveling lap sealant. Make sure you are in a well-ventilated area—outside is good. The lap sealant can make you a little dizzy, which is unsafe when you are on a roof. 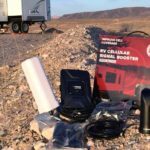 Performing RV roof maintenance outside will help tremendously. Now go to the areas you noticed or marked earlier, again starting at the back of the coach, and apply the sealant liberally. You don’t need to worry about making it look pretty. It’s on the roof and, unless your friends have a helicopter, they’ll probably never see how hard you worked anyway. The important thing here is to make sure you fill in all of the cracks, from the hairline ones to the major crevices. Because the sealant is self-leveling, it will seep into the cracks and fill them up on its own. What you should see when you are done is a nice white layer of lap sealant that has no visible cracks or openings. On your way back to the ladder, double-check all of your new sealant and make sure you don’t see any cracks and that you didn’t miss any spots you originally marked. That’s it. You’re done! It took me about three hours to do my RV roof maintenance. Now, go on and enjoy an ice-cold beverage and celebrate knowing you’ve saved yourself enough in repair costs for that new retractable ladder you’ve been pining for. It is important to not use this self-leveling lap sealant on vertical surfaces as it only works on horizontal surfaces. Also, don’t use it on skylights. Lastly, set yourself a reminder to check the RV roof again in about six months. It should still be fine, but it’s good to check. Thanks for all the info some places say to strip off the old stuff and some don’t who knows which is right? Did it seal pretty evenly over the old sealant? That’s a good question. We’ll reach out to the author of this piece and see if they have an answer for you! 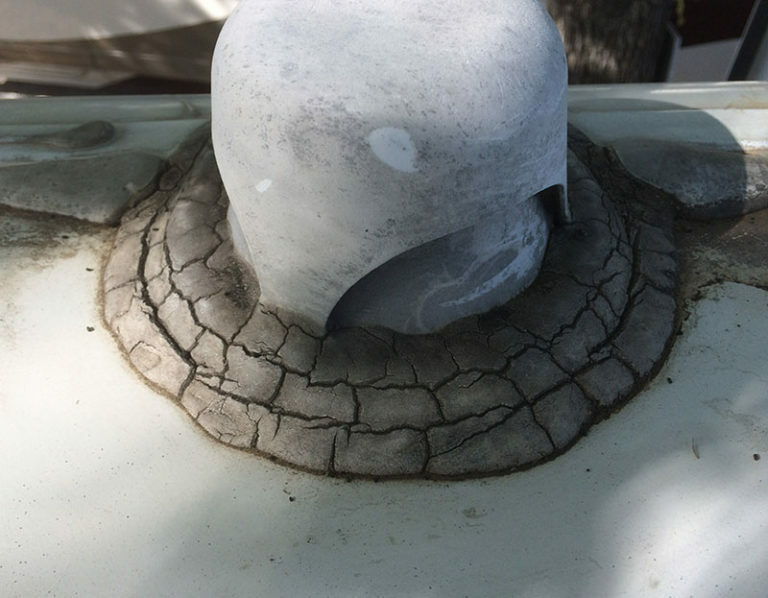 Taking the time to perform the proper maintenance procedures can help an RV owner avoid a lot of issues with their roofing over time.Neglecting to do proper RV roof maintenance is a recipe for disaster. If unsure about how to properly maintain an RV’s roof, the owner will need to take the time to find the right professionals to assist them.